Saathi pads improve women's well-being and keep millions of tons of waste out of landfills. With its sanitary pads for the Indian market, startup company Saathi solves two problems at once. Just 16 percent of women in India use them due to poverty and other reasons, which causes health and social issues. At the same time, manufacturing them wastes millions of gallons of water, and two million tons of pads end up in landfills every year. To help with all that, Saathi's pads are affordable, made from discarded banana tree fibers, manufactured in a sustainable way and 100 percent biodegradable. Engadget met with Saathi co-founders Kristin Kagetsu and Tarun Bothra at the Hello Tomorrow conference in Paris. The company not only won €15,000 in the wellbeing cateogry of the Hello Tomorrow Global Startup Challenge, but also the €5,000 Impact prize and grand prize of €100,000 -- a sweep of all categories. We take sanitary napkin usage for granted in North America and Europe, but it's a huge issue in India and other developing nations. 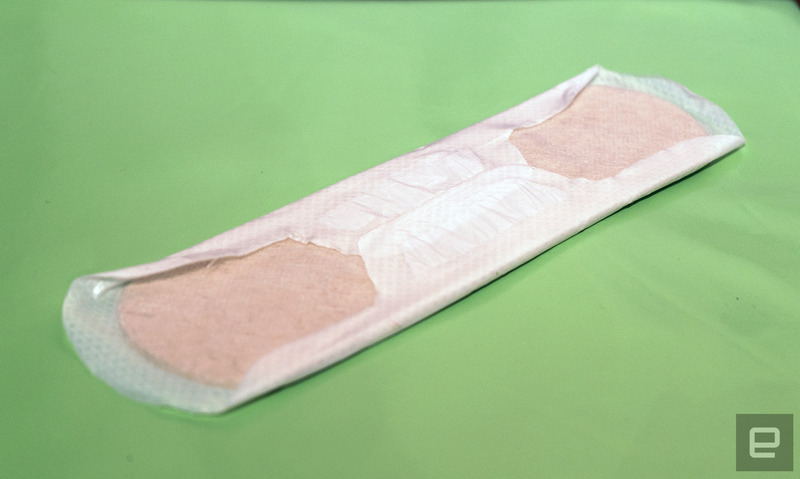 "In India, out of 100, only 16 women use sanitary pads," Bothra told Engadget. "It varies from region to region as to why. In some places it's not affordable and in others there are religious taboos. There is [also] a lack of education, so they stick to the old ways, which is tree bark or just normal cloth which causes UTIs (urinary tract infections) and other hygiene problems." To handle the economic issue, Saathi sells its pads in rural areas at cost and for profit in urban areas (it's distributed in biodegradable, organic plastic sacks in villages and in boxes in cities). At the same time, it is doing educational outreach. "With the 'One Million Pads' initiative, we're able to distribute pads to rural Jharkhand," Kagetsu said. "We're also doing an impact study to see what the difference is when they have pads, and particularly, biodegradable pads, because in rural areas there's no waste infrastructure to deal with disposal." The pads have a modern, comfortable design with wings to prevent leakage, and the banana fiber material is 50 percent more absorbent than chemical products used in regular sanitary pads, the creators say. The material is surprisingly soft to the touch and doesn't irritate skin. "The structure of banana fiber itself is good for absorbing water; it's better than cotton," said Bothra. "We don't use bleach, we don't use sodium acrylate or any other chemical. They're not skin friendly and can cause rashes and UTIs. Because they contain no plastic or other non-organic materials, the pads biodegrade into compost in just three months, or six months in a landfill. At the same time, they're more environmentally friendly than organic pads created from cotton farming, which consumes millions of gallons of water. During manufacturing, no bleach or other chemicals are used, and any water consumed is recycled for banana plantation irrigation. "We're using banana tree fiber, agro-waste, because the trees have to be cut down every harvest anyway," said Kagetsu. "Growing organic cotton is very expensive, and it uses six times more water." Hello Tomorrow is about cutting edge science and technology startups, yet the startup challenge was dominated by a low-tech product. Unlike most tech products, though, which might deliver convenience or slight improvements, the pads offer dignity and a better life for women. Saathi notes that rural girls can miss up to 50 days of school every year due to a lack of sanitary pads and other hygiene-related products. "The goal is to help keep women at school and at work," Kagetsu said.